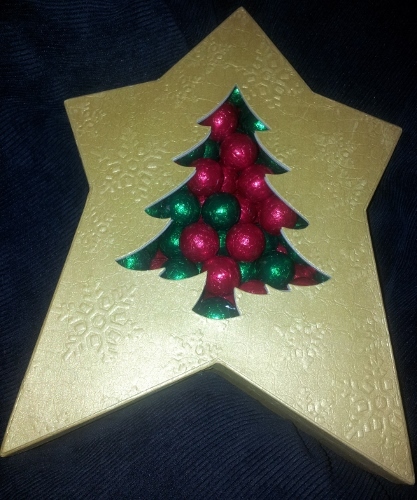 1KG XMAS TREE BOX WITH CHOCOLATES BAUBLES! WOW them with 1kg of quality belgian milk chocolate baubles in RED & GREEN in a gold XMAS tree box. They measure from the tip to the bottom about 20cm and 12cm at the widest point. The height is approximately 6cm. Excellent for staff gifts or to give as inexpensive gifts to multiple individuals or clients. GET IN EARLY BEFORE THEY SELL OUT!